In Zambia we work in the Kalomo District of the Southern Province, where we have developed a strong and dynamic relationship with the Kalomo District Education Board and over 25 schools. Kalomo remains one of the most impoverished in the Southern Province with some of the lowest examination results in the country according to Government statistics. We are the only permanent international NGO presence in the District. Literacy rates in Kalomo lag behind the Zambian national average and the district consistently ranks low in the National Examinations League. With the District Education Board, we identified lack of trained teachers as a main contributing factor to this poor performance. 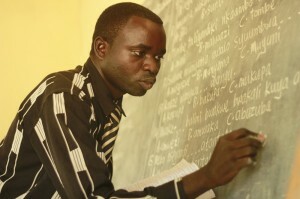 Many community teachers are working without training, and often without pay. In the past we’ve worked with the District Education office and local teacher training colleges to get community school teachers trained and qualified. We incorporate teacher training exercises into many of our programmes in Zambia – we believe that teacher training will boost quality standards and improve educational outcomes for children in the district. We are continually fundraising for textbooks and learning materials. Many community schools don’t have textbooks, others have outdated textbooks or textbooks that are battered and tattered from overuse. Unlike many books that are donated or provided to schools, these books are tailored for the African classroom, using familiar animals as characters and well as familiar rural and urban African settings. These books also use the Keyword learning methodology, which is particularly supportive to children who use English as a second language, like many of those who attend the schools we work with. We try to make classrooms into attractive learning spaces by decorating them with educational posters and colourful visual aids to complement learning.